Individually packaged vanity kit. 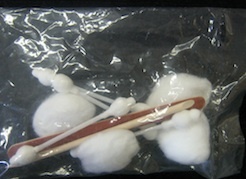 Includes 1 Emory board, 1 cuticle stick, 4 cotton balls and 4 cotton swabs. Sold in quantities of ten sets. Discount for 5 sets or more.